This is hail and farewell to you all from the staff of Roundup. It certainly has been about as pleasant a job as a man can get in the Army, and the association we have made in this rather un-military duty of "keeping the Theater posted" have been in the main been friendly ones. General Stilwell, at the inception of Roundup wrote: "It's your paper... We want it to be the most readable sheet." That was three and a half years ago. Many thing have happened since then. You, our readers, are the best critics of the kind of job that has been done by this "fish wrapper," as the first editor, Fred Eldridge, was want to call it. Judging from the enthusiastic greetings from the generals on this page, it would seem that Roundup has accomplished its mission. But whether Roundup has been completely successful is a question that pales into insignificance before the more personal challenge that awaits most of us. We're going back home into a post-war world that will seem strange to us at first - but whose day-to-day problems will face each of us for the rest of his life. What have we, as individuals, got to offer our communities and our country? Has our experience overseas, following orders, following the rules and regulations of Army dictatorship, hurt our spirits, damaged our characters, or touched the quick of our natural democratic leanings? Or will that same experience prove of value in the future? Roundup has been chiefly devoted to covering the news, both of the Theater and the world, providing entertainment features, and bringing a little bit of America to the service men and women in the I-BT. Since November we have been restricted on letters to the editor. We have written no editorials since V-J Day. What has been the result? Roundup has been termed "a house organ" and "a toy of the brass" - whereas it originally was planned strictly as a GI's newspaper. To this charge, we have to plead at least partially guilty. Whether this has made us, as GI newspapermen, look rather like Mr. Milquetoast, is up to you. Changes in the staff personnel have brought changes in policy. We have not made the fight that the members of the Rome edition of Stars and Stripes have against "Army censorship." As we see it, official War Department policy toward GI publications must be revised and made abundantly clear. The wartime soldiers included many compotent journalists from civilian life. Will there be enough talent to publish creditable journals in peacetime? And will Washington allow GI editors to adopt independent editorial policies> Both the wartime and peacetime soldier should be given a chance to air his gripes and opinions. But space should also be given to official Army replies - which should be written to the point. At present in Washington a board of reservists, including four officers and two enlisted men, is conducting hearings on the so-called Army "caste system." Its findings and recommendations should be studied carefully. (1) Separation Pay be paid to all veterans of this war in proportion to their domestic and overseas service not to exceed $2,000 but to be paid immediately. No one should be entitled to any payment with less than three months' service. That amounts given to veterans for education should be deducted from individual payments. This is to shorten bickering that is bound to come. (2) All personnel should wear identical uniforms with all personnel below the grade of major billeted in common quarters and messing together. The Army has ruled that common uniforms will be worn in 1948. That change should come sooner. (3) The Information and Education program should be improved and a higher calibre of personnel assigned to the lower echelon of that program in a full-time capacity. (4) Promotion should be based entirely on merit - not on seniority. More commissions should be made directly in the field. (5) There should be no social "off-limits" areas to any soldier. Less segregation should be the rule. Equal rations of food and drink should be made to all personnel. (6) Enlisted men should serve as jurors at Army court martials. (7) The purpose of the salute, originally planned as a greeting of respect from enlisted man to officer and from officer to enlisted man, has been lost. It should be used only on military installations and in occupied areas. (8) The Inspector General's Department should work entirely apart from the rest of the Army, carrying out its inspections without any advance warning. (9) The classification system should be more painstaking and thorough, actually seeing to it that the right men are put in the right jobs. We ask you all to think about these things. And as we face the trip homewards, let us remember that many soldiers - officers and men - died to win this war. And as civilians, we can and must consider it our duty to pay attention to what goes on in the world today. If we don't, we may be scattered all over it... fighting again, tomorrow. By and for the enlisted staff of Roundup. Sgt. CHET HOLCOMBE, Editor. "Since its first issue in the bleak days of September, 1942, Roundup has rendered honest and faithful service to our soldiers in China, Burma and India, and to the country they represented. In these brighter days I am happy to congratulate both Roundup's editorial staff and readers for a job well done." "I appreciate your thoughtfulness in giving me this opportunity to say "good-bye" to our Theater and our newspaper. I remember so well when the first Roundup was published. It started off right at the beginning with the form and style that made each issue eagerly awaited. Everyone was agreed that it was the most important factor in keeping up the fine spirit and morale of the Theater. You and your associates should feel proud of advancing so completely the objectives set by yourselves and approved by General Stilwell. A file of Roundups is the best record a history of the Americans in China, Burma, and India. It is also the most interesting and enjoyable. In saying farewell to the men of the Theater and to the staff of Roundup, I desire also to express my sincere best wishes for your good health and success. Good luck, always!" The Presidio of San Francisco "Congratulations on your record as the best soldier paper of them all. Roundup has accomplished its mission and can fold up with a feeling of satisfaction that it never missed a chance to crack down on injustice or laugh at stuffed shirts. And that is the chief reason that all through its existence it was one of the biggest morale factors in the Theater. A bouquet to all who labored to make it so." Washington, D.C. "On the occasion of the publication of The Last Roundup, I would like to express to the entire personnel of the I-BT my deep appreciation of a job well done. I know that the end of the Theater is drawing near, the majority of you will be returning to the U.S. for demobilization. If those of you who are to be demobilized, those of you who remain to complete the job, and those of you who proceed from here to new assignments, put into your ventures the application, the hard work, the tenacity, and the loyalty which I found and have been proud of seeing while in the I-BT, I know that you will find happiness and success. I would also like on this occasion to thank the present and former members of the staff of Roundup for the hard work they have done and to thank them for presenting the Theater and its personnel with a newspaper which covered news events in and out of the Theater with a professional ability of which the staff can justly be proud." Washington, D.C. "Roundup has always done a splendid job; it palyed its part magnificently in accomplishing the Theater mission. It gave us news of home and the outside world; it amused and diverted us. Its loyal staff, with untiring energy, made the paper the best theater paper of them all. I shall surely miss it in the future. My heart was and still is in the India-Burma Theater and with the men who made the operations there such an outstanding success. It took real men to do that job - men of determination, guts, and valor. They accomplished the impossible time and time again. Every man who served there can be proud of the part he played. They will always have the satisfaction that comes from a job well done. Whenever two or more wearers of the India-Burma patch meet, there is a reunion. I am sure that the bonds of fraternity, friendship and mutual understanding which united us during the days of war will also bind us together in future years." New Delhi, India "With the publication of The Last Roundup, we in India-Burma regretfully part with an old and true friend. Roundup has served us faithfully and well. No other Army newspaper has contributed as much for the personnel it served, nor has any other been as much appreciated by its readers. We who served in the old CBI or I-BT owe it a debt of gratitude. To the staff of Roundup, past and present, congratulations for a job well done. After a little over 65 months of operation the geographically largest Theater in World War II - the land from Singapore to Karachi, from Java to the Himalayas, the Theater which once comprised all of China - is about to shut up operations and go home. Its men worked in some of the most difficult jungle and desert terrain in the world; they sweated under the intense South Asiatic sun; they performed their mission despite the fierce prevalence of tropical disease. ROAD'S FIRST CONVOY The first convoy over the Stilwell Road winds over "the Hump" to China some 40 miles from Namkham, Burma. The India-Burma Theater, once the China-Burma-India Theater and a former branch of the Allied Southeast Asia Coomand, is packing up for return by first available transportation to the Zone of the Interior: the U.S.A.
Its history goes back to December 30, 1941, when President Roosevelt suggested to Generalissimo Chiang Kai-shek that he assume command of the Allied forces in China. Chiang responded by appointing an American Chief of Staff: Joseph Warren Stilwell, at that time a three-star California general with a campaign hat that looked like a cowboy's and the nickname of "Vinegar Joe." 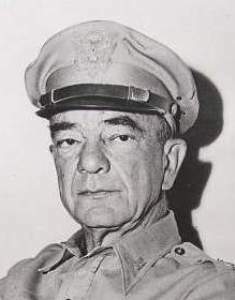 Stilwell organized a mission of 32 officers and 18 men to increase the combat efficiency of the Chinese Army and the party landed in Karachi the end of February, 1942. A week later the China-Burma-India Theater was officially christened with headquarters at Chungking, China in Macrh. Stilwell took charge of the Chinese armies in Burma, and the 10th Air Force landed in India under Maj. Gen. Lewis Brereton, its planes having detoured from Australia on up around Java. Meanwhile, the Japanese continued to push their offensive and took Rangoon, the greatest city in Burma. Two Flying Fortresses, the first Army Air Force offensive in the CBI, retaliated by damaging a Japanese cruiser and troop transport off Port Blair in the Adaman Islands on April 2, 1942. Right after that, the first U.S. Army flight over "the Hump" was made with Col. William D. Old in the pilot's seat. The Japanese pushed on through Mandalay to Lashio in central Burma and drove on toward Myitkyina in the north. "Vinegar Joe" and his Chinese forces were badly equipped and out-numbered. They had to retreat. They were pushed back steadily from Shwebo in Burma to Imphal in India. At first it was by truck, but jungle trails made that impossible and the rugged general set the pace himself for the 150-mile march back into India. When the retreating party finally reached safe territory, the man with the cowboy hat and steel-rimmed GI glasses said, "We took a hell of a beating. We ought to find out why it happened and go back." And "Vinegar Joe" wasn't fooling. The Japanese had overrun Burma and strangled the Burma Road, the only Allied supply route to China. The enemy was now threatening to invade China from the south and India from the northeast. The most critical need was somehow to get the supplies into China and keep her in the war now, after those five gallant, solitary years of holding the Japanese at bay. In June, 1942, the India-China Wing of the ATC was organized and the supplies were flown in over the "Hump" - the roof of the world, the Himalayas of Asia. And then, to prepare for the eventual land offensive, Chiang Kai-shek gave his consent to the establishment of a training center for Chinese troops at Ramgarh, where American and British Army personnel would equip and prepare them for modern jungle warfare. The "Hump" then became a two-way traffic channel: Chinese armies were flown back to India on the ships that brought cargo to China. Simultaneously, the fundamental U.S. Army organizational plan was formed and Headquarters established in New Delhi for SOS activities. Three Base Section headquarters were made at Karachi, Bangalore and Calcutta and two Advance Sections temporarily established at Agra and Dibrugarh. Then APO 886 at Karachi, the first Army Post Office in the CBI, started funneling mail to the troops by the end of May. July 4, 1942, the nation's birthday and the day the Flying Tigers finally won Army recognition; the American Volunteer Group became the China Air Task Force under Brig. Gen. Claire L. Chennault. The Chinese Army in India (the CAI) began its first courses in Artillery and Infantry training at Ramgarh in August and by the end of the year 21,000 of Chiang's soldiers had been flown over "the Hump" for this experimental program of one nation's army training another's. Stilwell approved the CBI patch for military personnel in the Theater in September, 1942 and by February, 1945 the War Department was to get around to recognizing it as well. Col. John C. Arrowsmith to Ledo in November to make a reconnaissance of what was to be known as the Ledo Road. It was a completely new approach to the Chinese end of the Burma Road and would skirt around Japanese lines in Burma. The following month Ledo was established as Base Section No. 3 with the dual purpose of supplying construction operations on the Ledo Road and acting as a depot for future tactical operations into Burma. Then the Japanese became frisky. On Dec. 20 Calcutta was attacked from the air and during the next ten days there were four more air raids. The effect was negligible, causing little damage to the dock area on the Hooghly and none at all to U.S. installations. At the close of the year 1942 the CBI Theater strength showed 10,476 Air Force personnel, 4,622 SOS, 1,599 ATC and 394 Ground Force men - a Theater population of 17,091. 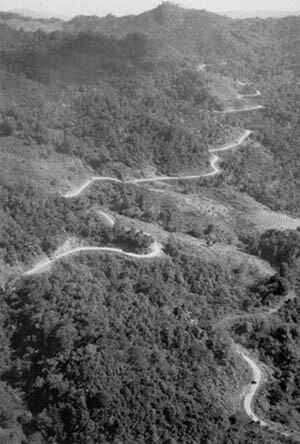 The Ledo Road had pushed from Assam into Burma at Mile 43.3 on the last day of February, 1943. Things were picking up in China too. Chennault organized the 14th Air Force with headquarters at Kunming and SOS Advance Section No. 4 was established in Kweilin, a great step forward into that strip of eastern China not yet occupied by the Japanese. And to keep up the morale of the troops, the first Armed Forces Radio Station, VU2ZY, began broadcasts in New Delhi on March 23, 1943. back in the States the supply POE for the CBI was switched from Charleston, South Carolina to Los Angeles. Yank came to the CBI with the publication of the mid 1943 issue from its new Calcutta office. Air power grew rapidly in 1943 with the 10th and 14th Air Forces not only counter-attacking enemy planes, but bombing Japanese installations all over Southeast Asia and Eastern China. At the end of the year we had unchallenged air superiority over our own vast land stretches and when Maj. Gen. George Stratemeyer was made commanding general of USAAF in the CBI, the Theater had become a major air command of the U.S. Army. Global warfare meant global planning and when the Quebec Conference was held between Roosevelt and Churchill in August, 1943, they had their thoughts on the CBI, just half-way around the world. It was there decided that Lord Louis Mountbatten, cousin of King George VI, Admiral of the British Fleet and leader of the commando operations along the coast of western Europe, was to be the Supreme Commander of an Allied Southeast Asia Command. Stilwell was named his deputy and he and his CBI Theater now came under the Joint Chiefs of Staff. LAYING THE PIPELINE Heavy rains and deep mud force these engineers to carry this pipe section through the thick jungle. Quebec also approved the formation of a lightly-equipped, air-supplied jungle force, later known as the "Marauders" of Brig. 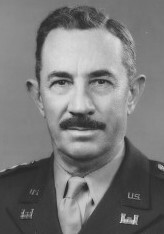 Gen. Frank D. Merrill. Its and the mission of the British units similar to it was to clear North Burma for the advance of the supply lines into China. To facilitate air operations on the other side of "the Hump," the planners of Quebec also considered the construction of the Pipeline to Kunming. By mid-October, "Vinegar Joe" had had enough of watching the Japanese advance and entrench. He blew the whistle and the Chinese 38th Division's 112th Regiment went into battle. Their mission: to secure the Dalu Valley and part of the area west of the Tarung River in Burma. By the end of the month the first volunteers for the Gallahad Force (Merrill's Marauders) arrived in Bombay on the S.S. Lurline. The Chinese regiments were progressing nicely by now and the 113th took Shingbwiyang in North Burma. During October the ATC began its 24-hour daily operations over "the Hump" with gasoline, ammunition and supplies for China. And very soon after, the first group of the futute XXth Bomber Command arrived in India. December 1943, and the Japanese made their second annual air raid on Calcutta. This time the raiders were in greater number. They did some damage to the Calcutta docks and their bombers also made a raid on the Dinjan air fields in Assam. Global planning again focused on the CBI when Roosevelt, Churchill and Chiang Kai-shek met in Cairo on Dec. 6, 1943, and planned the VLR (Very Long Range) fields of China and West Bengal for the next year's use by the brilliant new B-29 bomber. They also gave the go-ahead signal on construction of the Pipeline, to be laid from the oil storage tanks at the port of Calcutta, up through the sirfields of Eastern Bengal, past Ledo and eventually to the "Tank Farm," right inside of Kunming. With the beginning of 1944 two key appointments were announced by CBI headquarters: Maj. Gen. Daniel I. Sultan was made Theater deputy commander and Brig. 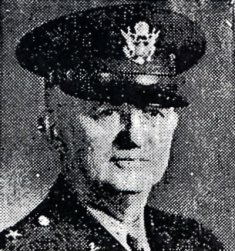 Gen. Frank Merrill took command of the 5307th Brigade, the Marauders' official name. On Feb 9th the Marauders left Ledo for their march into Burma and on the 22nd they received their first combat mission: to cut the road in the vicinity of Walawbum and attack the Japanese 18th Division command post, believed to be located there. They contacted the enemy at Lanem Ga, North Burma, and the lead scout, Pvt. Robert W. Landis of Youngstown, Ohio, was killed. Landis was the first American Infantry soldier to lose his life in battle on the Asiatic continent since China's Boxer Uprising in 1900. In their first encounter with the enemy at Walawbum, the Marauders set up a road block and took them by surprise, killing 800 Japanese and losing only five of their own men. Before the completion of their mission these Marauders were to make more than 700 miles of severe jungle marches through Burma and Assam. To insure the best communication with forward areas, the U.S. Military Railway Service took over the bengal and Assam Railroad. India's railways now worked on "stop-watch" time. Col. Phillip Cochran ("Flip Corkin" of comic strip fame) began flying penetration forces of the First Air Commandos to "Broadway," the secret jungle airstrip northeast of Katha, then being readied for a behind-the-lines strike at the Japanese in North Burma. FRONT LINE ACTION Here a 75mm Pack Howitzer is firing away at enemy lines during the Burma Campaign in 1944. 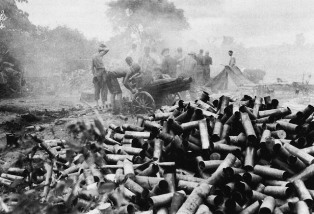 The brass in the foreground represents nine hours of shells, accumulated while giving cover to the advancing infantry. One day after April Fool's Day the first B-29 Superfortress landed in India and the joke was about to be on the enemy. And that same month two Chinese divisions were flown down from China to fight in the Hukawng Valley. The Marauders broke the enemy siege at Nhpum Ga and on May 17, along with the Chinese, scored their first major victory in the Burma campaign: the capture of the Myitkyina airstrip. Mid-April and a British ammunition ship exploded in Bombay harbor, destroying 15 other ships, killing an estimated 2,000 and tumbling a good part of the harbor installations into the water. Later, the ATC and the Air Forces established their Theater headquarters within the compound of the Warren Hastings Jute Mill, right outside Calcutta. SEAC became restless too and Mountbatten and staff moved from New Delhi to Kandy, Ceylon, near the base of the fleet which he someday hoped to lead in the recapture of the peninsulas of Southeast Asia. Theater morale was given another boost in the summer of 1944 when the CBI branch of USAFI opened in Calcutta. The first B-29 mission from Indian bases, the raid on the Makasan Railway yards at Bangkok, Siam was made in early June and a week later the Superforts bombed Japan from China bases, successfully damaging the imperial Iron and Steel Works at Yawata on Kyushu Island. In Burma, the Chinese Expeditionary ("Y") Force launched a five-column offensive across the Salween River to drive the Japanese from West Yunnan and clear China's part of the Burma Road. A few weeks later it fought its way into the walled Chinese city of Lungling. Simultaneously, Chinese and American forces captured Mogaung and thus cleared the entire Hukawng and Mogaung Valleys. In mid-June 1944, the Japanese launched two offensives, capturing Lungling back from the "Y" Forces on the Burma border and threatening to take Changsha in central China, heart of the "Rice Bowl" district and strategic key to control of the Canton-Hankow Railway. By the end of July the 5332nd Brigade was organized and assigned to the Northern Combat Area Command in Burma. This brigade later became known as the Mars Task Force and, together with the Marauders, went down in I-B history as the major body of U.S. fighting forces in the Burma campaign. On August 3, 1944, Myitkyina, the main objective of the North Burma campaign, fell to Allied forces after a 78-day siege. Although the airstrip had been taken since mid-May, it was only after the Marauders had had their ranks enormously depleted by exhaustion, jungle disease and enemy harassment and then reinforced with combat engineers and stateside replacements that their remnants were finally able to join the Chinese in taking the town. Within a week the railway from Myitkyina to Mogaung started operating with an improvised "jeep-on-rail" train service. Then, their mission achieved, the Marauders were inactivayed. In mid-August, the British had annihilated the last of the Japanese invaders from the borderlands of India near Tiddim, killing 30,000 of the enemy. 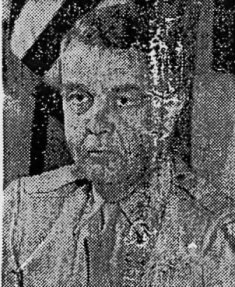 In October, 1944, Stilwell was recalled to Washington and his CBI Theater divided into the China Theater under Lt. Gen. Albert C. Wedemeyer and the India-Burma Theater under Lt. Gen. Daniel I. Sultan, former CBI deputy commander. With the division of the Theaters, China had a strength of 25,002 and the I-B of 179,687. The Chinese Expeditionary Force, fighting on the Chinese-Burma border through monsoons and mountains and across the precipitous gorges of the Salween River, captured the Japanese stronghold of Tengchung after a long siege. Turning south, it recaptured for once and all the Burma Road town of Lungling. During November and December of 1944 Chinese forces surrounded the Japanese stronghold of Bhamo, second largest city of North Burma. 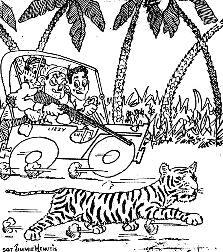 On Dec. 15 they took it and opened the way for the drive into Central Burma. At this time the 475th Infantry regiment of the Mars Task Force left Myitkyina for the front lines and tangled with the Japs for the first time near Tonkwa. With the help of the Chinese 22nd Division, Tonkwa was captured in mid-December. The men of Mars had marched 200 miles in 25 days to accomplish this initial victory. ATC HIGHLIGHTS From September 1, 1944 to August 31, 1945 the ATC Passenger Service: carried 1,204,207 persons, flew 350,209,660 miles. Transported: 515,598 net tons to China in 237,572 trips over the "Hump." Airlifted: 195,893 Chinese and U.S. troops, their battle equipment and their 4,400 pack animals. Evacuated: 4,720 patients over 2,181,496 flight miles. of aiming directly for it, as expected, they made a 35-mile forced march across country, caught the Japanese napping and secured some of the commanding ground overlooking the Road. After 20 days of furious fighting, the Mars Forces succeeded in completely crushing Japanese resistance. The last day of 1944 also saw the last Japanese air raids over Allied installations in North Burma. The enemy simply couldn't afford to challenge our air superiority any longer. And at the end of the year the I-B strength was practically 200,000, while that of the China Theater was just a little over 30,000. January 1945: the beginning of the last year of fighting. During the first part of the month the Chinese New Sixth Army, trained and equipped by Americans, was air-lifted back to China to form the nucleus of an effective fighting force against the Japanese in the long-promised China offensive. And then Shwebo, Burma was recaptured by British and Indian troops and the scene of Stilwell's humiliating retreat was finally avenged. As a classic example of "crossing your bridges when you get to them" the first motor convoy left Ledo for China on January 12, knowing very well the road was not yet cleared of the enemy, but confident it would be by the time it arrived. Ten days later the "X" and "Y" Chinese Expeditionary Forces joined at Mu-se, Burma, and the final mopping up of Japanese action along the Stilwell Road began. On January 27 Chinese veterans of the Salween campaign met Chinese veterans of North Burma at Mong Yu and the "Golden Spike" had been driven, the Ledo and Burma Roads were one. The first convoy, its faith in the road's being cleared vindicated, crossed the border into Wanting, China the following day. At the peak point of its construction the Road had 15,400 GI's working on it and it is said that an American life was lost for every mile of its length. The man whose dogged determination it was to reopen the land route to China was no longer around to see the glory: "Vinegar Joe" was now a four-star general and Chief of Army Ground Forces in Washington. PLOUGHING THROUGH A "Burra Sahib" survey party, mounted on elephants, passes M/Sgt. C. G. McCutcheon of the 1304th Engineer Construction Battalion, as he literally pushes the Ledo Road through to its junction with the old Burma Road in North Burma. And then came the comforts. The ATC inaugurated its C-54 flights direct from Barrackpore to Kunming for high priority passengers and cargo. Taking it the bumpier way, Maj. Gen. Lewis A. Pick, chief engineer on the road, led the first convoy of 113 vehicles into Kunming on February 4, 1945. Near the end of February the XXth Bomber Command, which had launched the first B-29's in the war, packed up from its gloomy Hijli prison compound in West Bengal and flew off to Guam and Tinian to join the Twentieth Air Force headquarters base. Bomb tonnage for the month of February had reached a new high of 4,367.6 tons dropped over enemy lines. Although only in its first month of operation, 30 convoys were dispatched over the Road to China during February and 5,231 tons of equipment delivered to Kunming. It was in february that Calcutta was named first of all Army ports for its net and gross discharge efficiency. On March 3 "Vinegar Joe" was finally given his due, and the Road he pushed through was designated the "Stilwell Road." Lashio, the old terminus of the Burma Road and an important hub on the supply route to China, fell to the Chinese 38th Division the first week in March. This was quickly followed by the British 14th Army's taking of Mandalay and capturing 30,000 Japanese prisoners. Sultan's three-pronged drive into Central Burma was comnplete and they were now free to advance south to Rangoon, the last great enemy throttle in Burma. meanwhile, the Pipeline to China under steady construction despite jungle, monsoon and shellfire, had been completed and the first gasoline crossed the Chinese border at Wanting on March 22. Just about the end of March the Admiral Benson docked at Bombay and became the last troop transport to have to detour to India's west coast. From here on it was the Bay of Bengal and Calcutta. The GI's held their own this month when 10 enlisted men were given field commissions for work in the Mars Task Force. On May 3, 1945 Rangoon fell to British amphibious forces. Pegu and Prome quickly capitulated and two days later Mountbatten announced the end of organized Japanese resistance in Burma and the conclusion of the Burma Campaign. The Japanese had 347,000 casulaties; the Allies, 27,905. The only Congressional Medal of Honor for the I-B was awarded posthumously to Lt. Jack Knight, killed while serving with the 124th Cavalry in Burma. And on the lighter side, an I-B ATC jeep turned up in France, AWOL with no one having even noticed it was missing. Near the end of May the Pole-line of telephone wires was added alongside the Road and the Pipeline to become the third communication and transportation link-up with China. The first telephone hook-up was made from New Delhi through Calcutta to Kunming on May 25. Now that the Burma Campaign was over, the Mars Brigade was disbanded and the American Air Force units withdrawn from the Eastern Air Command and sent to China. Redeployment of American and Chinese troops over "the Hump" and along the Road to China began. The spotlight was now on China and the I-B would be its supply artery more than ever. June was also the first month of redeployment for discharge: 1,500 I-B veterans sailed for Uncle Sugar. On June 23, Sultan was recalled to become Chief of the Inspector General's Department in Washington and his deputy, Lt. Gen. Raymond A. Wheeler, took command of the Theater. July, 1945, and the New York POE took over from Los Angeles to supply and equip the I-B. The 10th Air Force packed up at Piardoba in Bengal and flew to its new headquarters in Kunming. Monsoons were washing out sections of the Road but excellent maintenance work restored each wash-out, almost as it occurred. August 14, 1945, the day every man in World War II had placed ahead of Christmas - the Imperial Household of Japan accepted Allied surrender terms and gave the cease-fire orders. Mail censorship was off a while later and the pent-up personal griefs of almost four years of war exploded into letters home. But war over or no, the Pipeline went on pumping and the Road convoys kept on delivering. Over 9,000,000 gallons had been pumped to China since the line's opening April 9. The Road's monthly quota, of course, exceeded every previous month's record: in August it was 15,866 long tons. Demobilization got into full swing in September, 1945 with 80-point men leaving for home on the General McRae, the first evacuation ship to leave Karachi. The I-B got its fourth Commanding General when Wheeler was recalled to Washington to become Chief of Engineers and Maj. Gen. Thomas A. Terry, former CG of the Second Service Command in New York, was named new Theater chief. October was sort of a wind-up month. The last convoy over the Road arrived in Kunming on the 7th, giving the Road a grand total of25,783 vehicles and 6,539 trailers, carrying 146,948 long tons of cargo into Kunming since the first convoy drove over the Road the previous February. The last spurt of gasoline plunked into Kunming on the very last day of the month and this meant that 58,297 short tons of fuel had been delivered between April and October. ATC began to wind up its "Hump" activities and on November 20 the pilots who flew daily to China over the world's roof decided to call it a day. The India-China Division of ATC had flown 776,532 tons of material to Kunming in its three years of operation. There were losses too: 594 planes, 910 crew members killed and 130 still missing. The removal of U.S. dead to five centralized cemeteries at Singapore, Myitkyina, Barrackpore, Kalaikunda and New Malir began. This was destined to become the start of the last mission in the Theater, for the Graves Registration Service plans to work at shipping home these dead until 1949. By the end of December, 151,594 men from the I-B and China had been repatriated through India, a monthly average of 57,898 since the demobilization program started in early September. This left the I-B with 78,637 men and 8,013 officers on the eve of 1946. ACROSS THE IRRAWADDY Trucks are shown passing over the Irrawaddy River below Myitkyina on the GI-built barge bridge which allows for a 40-foot rise during the monsoon season. The bridge, the largest one built by U.S. Engineers, was recently presented to the Government of Burma in remembrance of the Campaign. Getting his last licks in, Roundup's reporter Sgt. Ed Alexander rode in the last American jeep across Stilwell Road into China on Chistmas Eve, 1945. And up in the weeds, all property left in Burma, save the Pipeline, tankage and heavy equipment, was sold to the Government of Burma. During last January the monthly evacuation of personnel had dropped to 17,679 and the Theater strength became 36,832. In February, 1946 the last Chinese Army personnel in India were airlifted to Shanghai, and activities in the forward area had dwindled to such an extent that Intermediate Section was consolidated under Base Section in Calcutta. 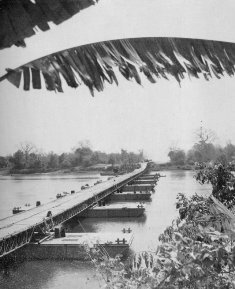 Only four U.S. installations now remained in Burma: the Road, the 4" and 6" Pipelines and that part of the Kuoming Toll Line lying in Burma. 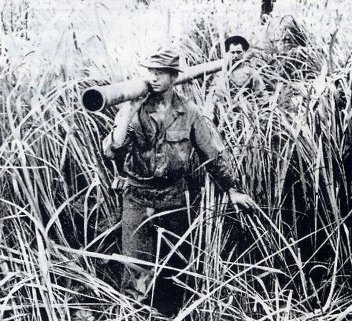 U.S. troops had been slimmed down to 46, all employed in jungle search and rescur work. On Feb. 17, Terry was flown home to Walter Reed Hospital for treatment of injuries sustained in an automobile accident near New Delhi. Maj. Gen. Vernon Evans, his Chief of Staff, assumed command. The India Wing of the ATC was placed under the North Africa Division of ATC and all Air Force activities were consolidated at the Bengal Air Depot. The last day of February the bottleneck of Theater demobilization - the manner of disposal of Army surplus property to the Government of India - was broken. FLC representatives and Indian officials came to an agreement and the custodial transfer of surplus property began. Last month, Undersecretary of War Kenneth Royall announced in New Delhi that he anticipated the I-B Theater's closing by the end of May, leaving only a residual group of 500 for graves registration work and similar activities. These 500 are to be progressively slimmed down and in a few months India will have but 100 to 150 men of the U.S. Army. With the sailing of the General Hersey April 21, all men with either 30 months of military service or 45 points will be on their way home. Theater personnel will be dropped to 2,100 in early May and the transfer of surplus property to the Government of India's custodians will have been completed. And so we have the history of the India-Burma Theater of World War II. From Dec. 30, 1941 to the end of May, 1946. Sixty-five months of combined effort on the part of the Chinese, the British, the Indians and the Americans. Its success was due to the cooperative resources of Allied nations; its campaign planning determined half-way around the world by Big Two and Big Three conferences. Sometimes under China, sometimes under the Southeast Asia Command of Mountbatten, eventually an independent U.S. Theater Headquarters, the I-B has had a vital role in the war against Japan. While the larger part of the land fighting in Burma was done by the British in the central and southern areas and by the Chinese in the north, the American forces kept hammering at the supply lines to China. Our ranks were composed primarily of air and service forces, not ground forces. The air arm protected the British and Chinese advances and drop-fed them. Our SOS Engineers and Signal Corps men followed the combat teams and laid down paths of communication and transportation as soon as the enemy had been cleared from the area. The India-Burma mission was to keep China's back door free, her forces supplied for a successful defense of the great Asiatic mainland, and to prepare for a day when British, Chinese and American forces would throw the japanese eastward as the Pacific forces pushed them west: an unprecendented pincer movement which would have incorporated and enormous part of this world's land surface. Because the enemy capitulated, that final strategy never became necessary. But the I-B had done its job up to then and it was fully mobilized to see it all the way through. Don't shoot until he smiles, colonel! It'll make a better rug that way. The ship which I-B Theater requested for April 25 will sail from Calcutta about May 3, Roundup learned this week. The Marine Panther is the vessel made available by the War Department. The Panther will sail to Calcutta from Seattle and return to San Francisco. The Panther has a capacity of 2,350. The Theater has been given authority by Washington to use as much space on the Panther as it can fill. Spaces left vacant by I-B will be filled in Manila from Pacific Area returnees. Theater Headquarters has issued quotas for the movement of personnel to Replacement Depot No. 3 from the period of April 16 to April 25 for embarkation on the Adder and Panther. Headquarters stated that all commanders have been ordered to re-examine their personnel needs about April 18, after the surplus property has been transferred, to see if they cannot release more men than originally planned. In order to fill as many spaces as possible on the Panther, Roundup learned, commanders have been informed they can get prompt approval of increases in their quotas. It is expected that all men moved in the quotas for March 24 to April 15 will be accomodated on the General Sturgis and General Hersey during April. Official authorization for the release of June 30 eligibles came from Theater Headquarters this week with the issuance of Circular 66. Circular 66 also outlined procedure to be followed in the cases of surplus officers and men who are not eligible for discharge under the June 30 criteria. Men in this category will be offered to all major commands in the Theater for reassignment before being moved to the Replacement Depot. If within five days, no other command requests their assignment, non-June 30 eligibles will be shipped to Replacement Depot for reassignment, which for all practical purposes means reassignment to China Theater, or with residual forces in India after the inactivation of the Theater, spokesmen said. If these men are not reassigned from the Replacement Depot they then may be sent to the U.S. either for reassignment or discharge, depending on authorities in America. ATC personnel not eligible under June 30 standards will be handled separately in accordance with instructions from the Commanding General, North African Division, ATC. This also includes AACS and 10th Weather men. Those eligible for discharge under the June 30 criteria, according to Circular 66, are: Enlisted men with 40 points or 24 months of service as of June 30; WACS with 24 months of service, or married women who apply for discharge; Officers with 65 points or 42 months of service as of June 30. Quotas for movement to Replacement Depot from April 16 to April 25 include 450 China-bound men. India's heat aroused Theater GI's thirst considerably during 1945, if figures from Theater Army Exchange Service are an indication. Approximately 89,000,000 bottles of beer, 19,000,000 bottles of coke, 12,127,000 cans of fruit juices, and 6,880,000 cans of Toddy were consumed in the I-B within that period according to Maj. Frank Keefe, Chief of the Army Exchange Service. BEER RATION UPPED With the coming heat and the resultant increase of parched throats, the ration of beer in the I-B has been raised from two to three (3) cases per man, beginning with the April ration. Theater Army Exchange Service announced this week. Hubba Hubba! 80,000,000 packs of cigarettes were puffed away in 1945. Sweet toothes were helped, too, as 31,105,000 bars of candy, 1,108,000 one-pound cans of chocolates, and 4,314,000 packages of cookies supplemented GI rations for the year. Maj. Keefe said the first Post Exchange in the CBI Theater was established in June, 1942 at Karachi. At this time there were only a few branch exchanges in operation: five in karachi, one each at New Delhi, Agra, Allahabad and Kunming. The Exchange Service has operated 310 branch stores employing 1,475 civilians with 620 enlisted men and 72 officers. The average monthly volume of sales was between $2,500,000 and $3,000,000. Dividends have been paid to the troops amounting to $1,651,341. There will be no further dividends but price reductions have been made on certain items for the benfit of all, Keefe explained. Items that could not be procured from the Quartermaster were purchased locally and direct from New York by the A.E.S. of this Theater. Items purchased in India were certain types of Insignia shoulder patches, evening bags, sarees, brocades and all types of curios. When the last ship pulls out of King George Docks sometime in May, it will still not be a complete farewell to India for American military personnel, because a small number of officers and men will remain behind after Theater inactivation to finish several jobs, some of which may take several months to complete. It is estimated that the settlement of all claims within the area, including Southeast Asia, will take some months to finish. The establishment and operation of military cemeteries and the continued search for isolated bodies will keep a handful of men busy for three years, according to present estimates. The prosecution of War Crimes cases will probably require three more months to finish up. The complex problems of financial settlements, payments of bills and claims, termination of contracts, and adjustment of reciprocal aid charges incurred after V-J Day, will probably take a considerable time to wind up. Some installations and property will have to be kept until the Theater is officially inactivated. These will have to be turned over after the last boat leaves, but it is planned that the turnover will take only about a month. It is expected that all personnel to remain in India after the Theater closes can be obtained from Regular Army or volunteer ranks. Above are the featured players Roundup selects as the two best USO Camp Shows that have appeared in the India-Burma and China Theaters since the war began. 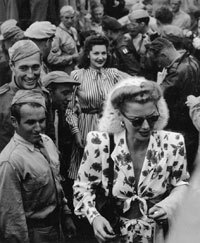 (Left) Jinx Falkenberg and Pat O'Brien are shown arriving in Chungking on Oct. 30, 1944. (Right) Metropolitan opera star Lily Pons, whose golden voice moved thousands of Theater troops. In reviewing the professional entertainment that has appeared in the Theater, Roundup's vote goes to the Pat O'Brien-Jinx Falkenberg and Lily Pons-Andre Kostelanetz USO shows. Special commendation, however, is also given to two men who have worked hardest to provide more entertainment and pleasant leisure hours - Maj. Melvyn Douglas, founder of the Entertainment Production Unit, and Lt. Col. John T. Trotter, Base Section Special Services Officer, now homeward bound. Frankly, we think that the USO Camp Shows, Inc., has never accomplished their mission in this and the China Theaters. Most of Roundup's readers will recall the highly-publicized, but quite brief, displays of the troupes of Ann Sheridan, who stayed 35 out of a promised 60; Joel McCrea, who never showed up; Paulette Goddard, who played 52 shows in 54 days out of a promised 60 days; Joe E. Brown, who was committed to 120 days in the old CBI, but remained only 37; and the Al Jolson troupe, who never arrived after being committed here, but played only as far as North Africa. This is no attempt to rub salt in old wounds but to review what the USO could, but never did, do. So in view of all this, all the more credit should be given to the troupes of O'Brien and Kostelanetz. Pat O'Brien's show arrived in India in October, 1944, after playing a full run in China. O'Brien, besides telling Irish jokes was emcee. Jinx, whose beauty is well known in these pages, sang songs, raised morale via a two-piece sun suit, and batted out autographed tennis balls. Betty Yeaton was a dancer who gave Jinx some competition in the visual-aid department. Jimmy Dodd beat a guitar and sang novelty songs. Ruth Carroll sang popular numbers and Harry Brown was the troupe's accompianist. They played to everyone they could within their time limit and accomplished a fine morale job that was the topic of GI conversation for some time after. Andre Kostelanetz is shown with Lt. Gen. Dan Sultan who is autographing his short-snorter bill up "in the weeds" in Burma. 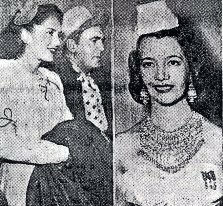 Lily Pons and her husband, Andre Kostelanetz, arrived in India in December, 1944, after playing North Africa, Italy, the Middle East and persian Gulf Command. Miss Pons cancelled her winter season with the Met in order to perform for Theater GI's and we trust the results were gratifying. This troupe really hit the rough spots in the weeds and completed a similar tour of China. Kostelanetz conducted a band of GI musicians, recruited from various units within the Theater which accompanied Miss Pons in her songs. They won the hearts of the boys stationed in the Far East. Special mention should be made here to Don Barclay, a USO trouper who has never received much publicity, although he has done one of the finest jobs of morale in this and other theaters. He has made two trips out here and has drawn untold hundreds of cartoon portraits of hospital patients. Maybe we've been picking on Ann Sheridan or maybe not. At least her jet-propelled tour of CBI in which very few GI's hardly felt the prop wash was the final blow. So a criticism was in order - even if Annie is from Texas. When it became quite apparent that professional nentertainment would be lacking, Maj. Melvyn Douglas, former screen actor who served in Theater Special Services, organized the E.P.U. which recruited talent within the Theater and performed in every sweat box and mosquito trap within the Theater. Many former professional entertainers were among the members of the E.P.U. who volunteered to replace civilian entertainment. Not only variety shows, but regular full-length plays were among the varied entertainment offered by the E.P.U. Douglas was in the U.S. when V-J Day came, recruiting more talent, and never returned. However, the E.P.U. has still functioned up to the closing of the I-B. Lt. Col. Trutter began to hit his stride in the Calcutta area after V-J Day, when special services moved to the front of essential activities. Calcutta GI's could never gripe of nothing to do when Trutter installed horseback riding, opened a 1,000-GI capacity swimming pool, constructed the Monsooin Square Garden with special entertainment there each night, and other activities. Sports activities were the big thing and Trutter always had a tourney going on in Calcutta. So regardless of what has been said, there were at least some attempts made to entertain Theater GI's. But nevertheless, the job could, and should, have been very much better. The following poem, written by Sgt. Smith Dawless of Los Angeles, first appeared in Roundup and was later acclaimed as one of the best pieces to come out of the war. We reprint it here in the hope that it will bring back memories of the old I-BT. The loveiest building of them all. Those are the only sights I've seeen. Someone lost our outlines of the above lassies, so we can't give you all their names. And what's in a name anyway? So this is your last look fellas. May you see the likes of the above in the flesh very, very soon. The Last Roundup on the Internet made possible by Lowell Simpson and Virginia Dyer. Copyright © 2018 Carl Warren Weidenburner. All rights reserved. This recreation of The Last Roundup was made using a photocopy of the original April 11, 1946 issue. Due to the poor quality of the photocopied pictures, better-quality images have been substituted where possible.